A battle of the newbie versus the champion. A diet grudge match pairs the recent winner of 2010 Dewmocracy, Whiteout in a diet form. 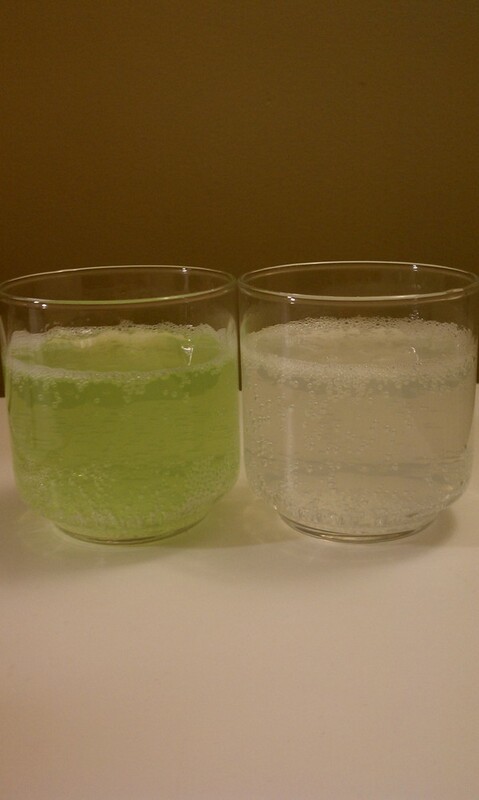 Versus Crave, a green apple flavored Mountain Dew. Whiteout has a huge fan base and my prediction will win this round hands down. How was the look, taste, and smell of Diet Crave? Crave is a sweet and sour apple flavor. Sounds good right? Well not exactly. The beverage smells great like a nice sour apple aroma, the color is appropriate and a bright neon green color. The taste however needs some work. I found it quite light and too dull. When I think sour apple, I want punch and pucker. From first sip I didn’t get much of either, it needed more flavoring, more sour, and even more sweetness to bring out the flavors out. The idea of having an sour apple soda is very appealing so at the end of the can I felt dissatisfied. How was the look, taste, and smell of Diet Whiteout? To preface this review, I did not like Whiteout in its original form. I thought it should have landed in third place in Dewmocracy. That being said I actually enjoyed the diet version. This Dew is clear in its pour and has a sharp citrus smell to it. Highly carbonated at first quickly dies to a medium fizz. The taste is like the mix if Diet 7Up and Diet Sprite had a lovechild. The light citrus turns slightly sharp and cools into a nice lemony finish. Whiteout also has a drying effect on your mouth which is kind of nice. Diet Whiteout really won me over for this match and gets my vote for the win!